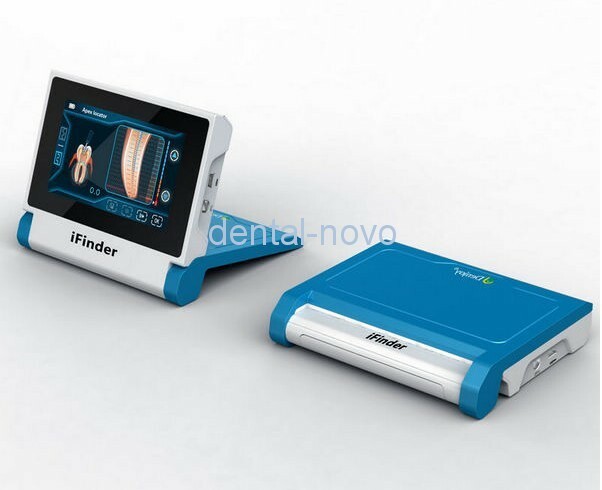 iFinder New Apex Locator is our latest model with touch-screen LCD used for determining the position of apex of the root canal with the up-to-date technology multi-frequency operation system. 3. It is equipped with separate calibrator test instrument which can check the operation of control part and spare parts of apex locator when apex locator doesn't measure well. 4. Touch-screen key and traditional button control both available. 1. 4.3 inch large color screen with real-time graphic of root canals. 2. Foldable design to create more choices for view angle. 3. Up-to-date multi-frequency operating system. 4. Rechargeable, do not need prepare extra battery. Valid values of amplitude between file holder and stainless electrode hook is≤130mV.